Applications are invited for AONSA Young Research Fellowship who wishes to perform neutron research at major neutron facilities in the region (but not in his/her home country) for the year 2019. The AONSA Young Research Fellowship Program has been established in 2014 to support highly talented young scientists in the Asia-Oceania region and help them to develop their expertise and career in neutron science and technology. The Program will provide financial support for Fellows to visit major neutron facilities in the region for collaborative research using neutrons. The Asia-Oceania Neutron Scattering Association (AONSA) is an affiliation of neutron scattering societies and committees which directly represent users in the Asia-Oceania Region. The overriding purposes of the Association are to provide a platform for discussion and a focus for action in neutron scattering and related topics in the Asia-Oceania Region. Course Level: Fellowship is available for young scientists to pursue research. 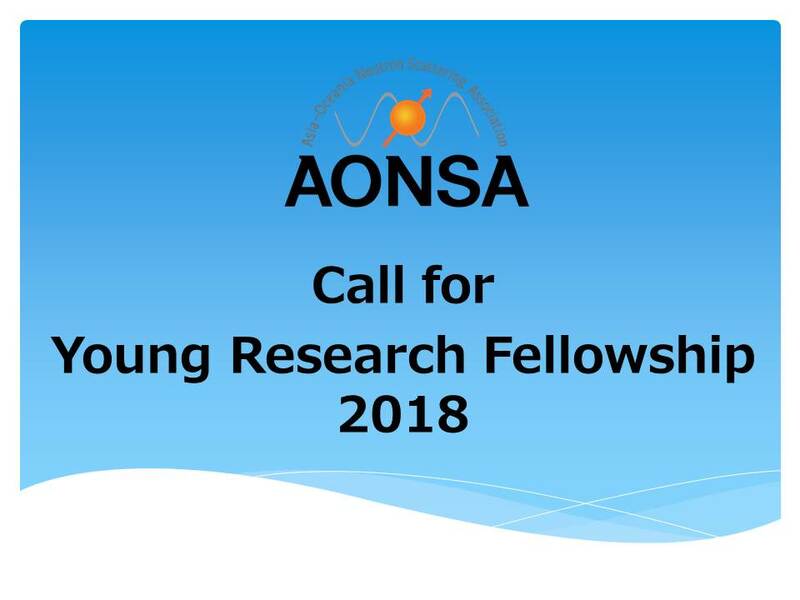 Study Subject: The AONSA Young Research Fellowship Program has been established in 2014 to support highly talented young scientists in the Asia-Oceania region and help them to develop their expertise and career in neutron science and technology. Scholarship Award: The Fellowship consists of a certificate of Fellowship award, one round-trip airfare between his/her home institute and the hosting facility, and local living expense at the hosting facility. The amount of support for local living expenses shall be determined based on the nominal cost of living and funding resources available. At least one staff member shall be assigned by the hosting facility to the Fellow as a collaborator and mentor. Nationality: The AONSA Young Research Fellowship Program shall be open to young scientists in the Asia-Oceania region. Number of Scholarships: A total of three Fellowship positions are available in this application round (one for each hosting Facility) and the possible duration of each Fellowship visit is 3 to 12 months. Scholarship can be taken in The hosting Neutron Facilities in 2019 are J-PARC (Japan), OPAL at ANSTO (Australia), and CSNS (China). Eligible Countries: The AONSA Young Research Fellowship Program shall be open to young scientists in the Asia-Oceania region. The AONSA Young Research Fellowship Program shall be open to young scientists in the Asia-Oceania region within 8 years of the completion of his/her PhD (as of the application deadline, excluding career interruptions) who wish to perform neutron research at major neutron facilities in the region (but not in his/her home country). The Call for Applications shall be announced by Chair of the Fellowship Selection Committee (SC) through the AONSA network including member societies, observers and other personnel determined by the SC. A standard application form (provided by AONSA) with all required information completed including a scientific plan for collaborative neutron research. A curriculum vitae including a full list of publications. One recommendation letter from a supervisor at the home institute. One letter of support from President of the home neutron society or a representative of home neutron community. The application shall be electronically submitted to the AONSA Office by the deadline indicated in the Call for Applications. How to Apply: Please send your applications electronically to the AONSA Office (fujii.misono@jaea.go.jp) with c.c. to limei-sun2000-at-163.com by August 31, 2018. The results will be communicated to applicants in November 2018 and the Fellowship visits will start in 2019. One recommendation letter from a supervisor at the home institute. A curriculum vitae including a full list of publications.